Explore the life and times of William Shakespeare, 400 years after his death, with this immersive photographic book. As the world's most famous playwright and his plays are still popular today! This book looks at what life was like in Tudor England, where Shakespeare grew up, delves into what the busy theatres of the time were really like. It also reveals which of Shakespeare's characters Queen Elizabeth I liked best! 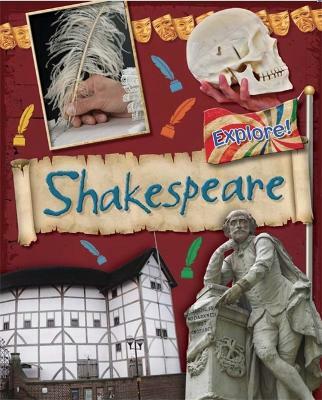 Read about the different types of play Shakespeare wrote and how he was influenced by the wider world, what it was like to be a Shakespearean actor and find out how to make your own model theatre! The Explore! series delves into the most fascinating topics around for children at Key Stage 2, looking at the topic through a variety of subjects including design anf technology, geography, art, literacy and numeracy.